UC Santa Cruz opens D-III play against Cal Lutheran (Feb. 17) and Whittier (Feb. 19)—a mere appetizer to the main course in March, which features six road matches. Coach Mike Napoli said he knew what he had in Magnus Ibh when he saw the incoming junior’s résumé for the first time. Following the Intercollegiate Tennis Association’s Division III West Regional in late September, everyone else is probably well aware of Ibh’s court prowess as well. A left-handed Danish transfer, Ibh advanced to the semifinal round in the Men’s Open Singles bracket in Claremont, and he garnered the ITA’s No. 16 regional ranking the following month. Ibh is expected to be a key piece this season for the Slugs, who are looking to return to the NCAA championships after narrowly falling short of a bid last season. Along with a core group of seasoned returners, including Chad Stone, A.J. Flora, Chad LeDuff, and Ryan Dugan, Ibh’s “high-level tennis-playing experience” and “clay-court style of game” will help solidify UC Santa Cruz as it tries to regain its footing in the national picture. Ranked No. 10 in the Intercollegiate Tennis Association’s (ITA) D-III Men’s Regional Rankings released on Jan. 18, UC Santa Cruz begins its winter/spring slate in the very same position where it ended last season’s campaign. But without a top–40 national ranking to begin the year, the Slugs know there is work to be done in order to improve their stature and ultimately score one of the few spots in the NCAA tournament in May. And the spots are few. Last season, the NCAA’s 43-team field was comprised of just two teams from “Pool B,” which is made up of true independents—like UC Santa Cruz—and schools from conferences that do not have an automatic bid. LeDuff noted the amount of experience UC Santa Cruz has this season, including a total of seven returners from last year. The foursome of Stone, Flora, LeDuff and Dugan, meanwhile, played both singles and doubles in nearly every match last season for the Slugs, who finished 6–8 overall. Whether it means UC Santa Cruz will extend its season into May remains to be seen, of course. The Slugs (0–1) on Jan. 21 dropped their first match of 2018 to Division-I foe Fresno State. But the team’s true test will come opposite a total of eight D-III challengers, five of which entered this season ranked in the top 15 in the nation, according to the ITA. 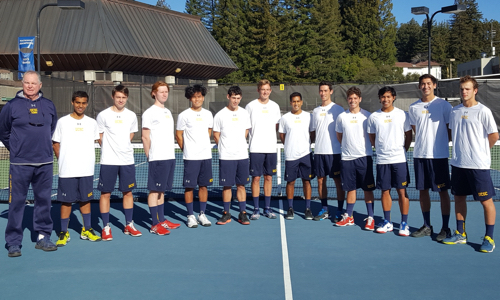 UC Santa Cruz opens D-III play against Cal Lutheran (Feb. 17) and Whittier (Feb. 19)—a mere appetizer to the main course in March, which features six road matches. Stops include No. 12 Pomona-Pitzer (March 24), No. 3 Middlebury (March 26 at Claremont), No. 11 Redlands (March 29) and No. 2 Claremont-Mudd-Scripps (March 30). A match against up-and-coming George Fox (March 28) is also on the slate. Buoying spirits was the team’s play at the ITA regional. Led by Ibh, LeDuff and Flora in singles, UC Santa Cruz easily exceeded last year’s performance. Stone (Carlsbad/Carlsbad High), too, was pleased with the team’s start in the late-September tournament, when he competed alongside Dugan (Coto de Caza/Santa Margarita High) to reach the semifinals in the men’s open doubles bracket. The duo in October earned a ranking of No. 24 in the nation by the ITA and No. 7 in the region. Stone and Dugan will anchor the doubles pairings, which Napoli said needs to be a strength as it sets the tone for the match. Flora is expected to team up with Ibh at No. 2 doubles, while LeDuff will be paired with returning sophomore Ryan Gee (Laguna Beach/Laguna Beach High) at No. 3. Napoli could also use the No. 3 position to showcase other less experienced players, considering three of UCSC’s top five players (Stone, Flora and Ibh) will move on next season. One player who could see action is Floyd Penners (Carlsbad/La Costa Canyon High), one of four freshmen on the Slugs. Napoli said Penners carries dual citizenship with the United States and the Netherlands, and, along with Ibh, continues the international flavor on this year’s team. Freshman Yaroslav Yanin hails from Moscow, while Dev Saraf is from Calcutta, India. “To me, this is the best team I’ve been a part of in all four years I’ve been here,” Stone said. LeDuff (Valencia/Valencia High) expressed a similar sentiment. He noted many of the Slugs who compete in doubles will do so in singles as well, which will boost confidence and court time. “We’re really looking forward to competing,” said LeDuff, who has a strong serve and forehand. He reached the quarterfinals in singles at the ITA regional and received a ranking of No. 23 in the region by the association in October. Last season, Stone and LeDuff played No. 1 and No. 2 singles, respectively. The addition of Ibh provides the Slugs another top option, though. “He’s not afraid to work the point. He’s not afraid to get into 10-ball rallies,” Stone said of Ibh, adding the Dane plays consistently and utilizes a heavy amount of top spin. “He likes to take a step back and let the point unravel in front of him,” he added. Ibh’s left-handedness and European style are unfamiliar aspects for a lot of D-III players, Stone said. It’s doubly beneficial for the Slugs, LeDuff added, who are able to learn from Ibh’s style of play.